You may not realize it, but even the tiniest spot of decay can mean trouble for your teeth. That's why we take such care to identify and fill cavities: it's the key to preventing all kinds of trouble down the road. In the past, diligent decay identification has required lengthy poking and prodding sessions. Unfortunately, even the best of such methods of decay detection are only 50% to 75% successful. Cavities can hide inside little fissures that occur on most back teeth. Further, mechanical exploratory methods typically find only those cavities that are equal to or larger than the probe head. For all of these reasons, we've recently invested in DIAGNOdent: a revolutionary new means of detecting cavities that gives us incredibly accurate and thorough information. DIAGNOdent technology inspects your teeth using a simple laser diode, comparing reflection wavelength to a known healthy baseline wavelength, thus uncovering decay. The process is simple. 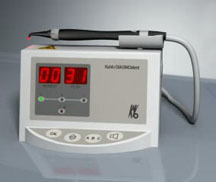 First, we direct the laser onto a healthy enamel tooth surface to provide the benchmark reading. Then, we move the diode around your mouth, shining the laser into all suspect areas. As the laser pulses into grooves, fissures, and cracks, it reflects a specific wavelength of fluorescent light. At the same time, this light is measured by receptors, converted to an acoustic signal, evaluated electronically to reveal a value between one and 100, and displayed on a screen. Whenever the laser encounters a discrepancy between a tooth surface and the healthy baseline value, it stimulates emission of a different fluorescent light wavelength. A reading of 10-20 indicates that there has been some enamel softening, indicating a potential problem area that merits close monitoring. 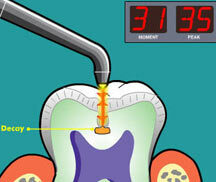 A reading of 21-100 indicates a definite area of decay requiring an immediate filling. DIAGNOdent technology gives us a tool for catching decay with more thoroughness, timeliness, and accuracy. Further, it requires no x-rays, so our staff doesn't have to spend valuable patient care time in the darkroom. It's a relatively simple and comfortable procedure. Not only does it help prevent the spread of decay, but it helps us to treat your teeth more conservatively as well. When we spot decay sooner, the necessary fillings are typically simpler and shallower, preserving more of the tooth. Finally, we can easily and objectively monitor any suspicious areas without repeated x-rays, harm to tissues, or need for protective measures.